In 2003, I was honored to be a part of the ELCA National Youth Gathering as bible study teacher/preacher. The theme of the Gathering was Ubuntu. In the teacher/preacher role I was given a vestment from Africa to wear. After the Gathering I was gifted the vestment by then Bishop Mark Hansen. When I returned to my congregation, a seamstress of the congregation, Nancy Bowman agreed to make me a copy of this vestment for every season of the church year. I gave her African fabric that had been gifted to me from a dear friend and I shopped at the African market in Harlem for some. So, I have been wearing this type of vestment called a dalmatic for over 15 years. I wear this instead of a stole because this vestment to me seems women clergy friendly. It feels more like me and it allows me to represent all of my identity. I am a woman of African descent who is a Lutheran clergy person. All of my vestments made of some African Cloth in the design I believe help me to be fully who I am and walk fully in my call. In May, when a historic moment in the ELCA took place, the election of two African American Women clergy to the office of synodical bishop, I reached out to my sister clergy and asked would they like vestments like these for the installation of these two bishops. I stated that I could commission dalmatics from tailors in Africa. They were as excited as I was about these events and wanted something special; I said that I could commission fifteen. I knew that I was traveling to Cameroon, Senegal and the Gambia before the installations of the bishops. Though I said fifteen, the request grew to over thirty. My job takes me to Madagascar, Rwanda and countries in West and Central Africa. I have come to know tailors in many of these countries. Commissioning tailors in countries in Africa would do a number of things: 1) it would help the local economies; 2) it would connect African descent women clergy to their ancestry; 3) it would be a public witness of our support for our sister bishops. To help with this task I enlisted missionaries in these countries to help. First was Anne Langdji, regional representative in Cameroon, she and her husband , Willie, helped me shop for cloth; commission their tailor Ruben and delivered vestments to the USA when they came for home assignment. Ruben made 20 of the vestments. The next missionary who helped was Rev. Kristin Engstrom who serves as the YAGM coordinator in Senegal. She also shopped with me, helped me think of designs and commissioned Sellie a tailor that she graciously shares with me to make the vestments. Sellie made seven. Kristin delivered them to the USA in July. I was also in the Gambia where I used the tailor Aliou who works in his cousin’s shop to make two of the vestments. The last five vestments were made by Rev. Janelle Neubauer’s tailor, Mark, in Rwanda. Janelle is the YAGM Coordinator there. Below is a picture of African American Women Lutheran Clergy gathered for Bishop Viviane Thomas Breitfeld’s installation wearing these vestments. We wanted to wear these vestments as a sign of our identity and of support for our two African American Women Bishops. I am now commissioning vestments for other seasons of the church year. I am able to do this because I am always westafricabound. My heart was broken open by pastors of the Lutheran Church in Rwanda. This happened as they responded to the brief three hour teaching that I did with them on Lutheran Theology and Preaching Law and Gospel. Rev. Kate Warn, YAGM Coordinator in Rwanda, and I traveled to Rukira, up a steep unpaved mountain road to be with this group. It was a request from Bishop Mugabo of LCR th at brought us there. The teaching began as I answered the question that Bp. Mugabo had posed to me “Why Lutheran?” He wanted me to discuss with his pastors what difference it made to be Lutheran. I started my teaching that needed to be translated from English to Kinyarwanda. Right in the middle of my presentation the heavens opened up and there was a down pour. So, I stopped talking and the pastors began to sing. Not only did this mostly male group sing, they also danced. They stretched out their arms like cow horns and seemingly began to glide graceful around the room. It was amazing hearing songs of praise to God and seeing dance to accompany it. As the rain poured so did my eyes. I then began to explain that we go to church to be strengthened by the hearing of the word, to receive Christ himself through bread and wine, body and blood and to be held up by the mutual consolation of the faithful. I am grateful that this seemed to be a satisfactory answer for this wonderfully inquisitive soon to be pastor. I am also grateful that the answer was in my heart and on my lips. The day continued with sharing, conversation and listening to the teaching of Rev. Prince, general secretary of the church, and others. Liturgy and the Augsburg Confession were also being taught. For some, this was the first time they had heard about these major tenets of the Lutheran faith. The next day they thanked Pr. Kate and I for making the trip up the mountain to be with them. They had a brief presentation and sang a song for us that included the beautiful, graceful dance that is part of Rwandan culture. They also prayed for the two of us. They asked God to provide us with health, strength and traveling mercies. They especially prayed for our safe passage down the mountain. They knew that we Americans would be frightened driving down a wet, slippery, muddy road. We were blessed. I am not sure what the pastors got from our time together. What I received was a strengthened love for Jesus; a renewed passion for the proclamation of the gospel and a heart for the people of Rwanda. From this visit I felt a wonderful sense of being and doing exactly what God would have me do! And doing what I love. I thank the bishop for the invitation and the pastors simply for being. As always, I am continually Madagascar, West and Central Africa bound. 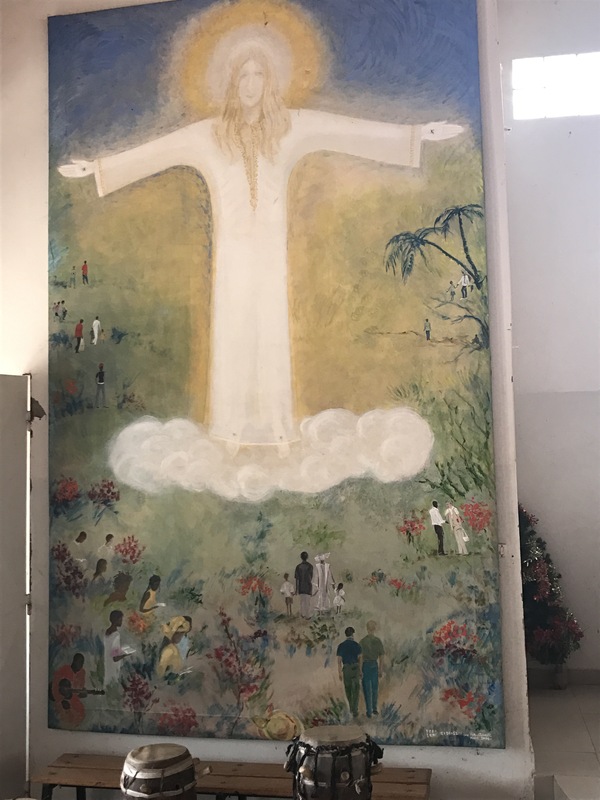 This beautiful picture is the first thing that you see as you walk into a church in West Africa. While it is a well done rendition of Jesus greeting and blessing the people, there is something problematic about this picture for me. Everything I have read tells me that Jesus was of Jewish descent and was able to blend in as he and his family fled to Egypt. That Jesus is not what I see represented here. Even in 2017 this is what can be seen in an African church. Enough said. But today I’m not feeling it! and bragged about what he can do to women. And that makes me angry! For those of us who have ancestors stolen from the shores of Africa, enslaved and treated in justly from the founding of the United States, I wonder just who America has been great for. Yes, I am proud to be an American when America is at its best, but now? As an American descendent from Africans this election makes me sad and worried. I am not worried about myself, I can in my travels get away from all the prejudice that has risen -up in the US. I worry for my dark brown son and all the little brown boys like my grandson. I worry because they may be in places in their own country and still be treated as though they don’t belong. I worry about women and little girls. I also worry about all those who I encounter around the world who voiced their fear as soon as the newly elected person came on the scene. They thought that his throwing his hat in the ring to be president was a joke. Now the joke is on all of us! I cry out is there a word from the Lord? While I wonder, how this will affect those who travel as US citizens? Will other countries close their doors? What does this mean for all the people I have come to love on this amazing continent of Africa? Will this election make it even harder for black and brown people to travel to the U.S.? What does this mean for you my friends? I ask because we all know that what happens in the United States affects the world. How I wish it weren’t so, but it is! Even so, as a preacher, I preach and my task is to set what is wrong with the world in-light- of the faith that we have in Jesus the Christ. That anything I say may give grace to those who hear. I am not doing so good this morning. The law is holding sway at this moment, because to me this situation really – leaves a bad taste in our mouths and a foul smell in the air. In the African American community, we have become used to foul smells. The smell of gunfire on the streets as a black or brown male child lays dying. The smell of decay as communities suffer from the greed of corporations, the prejudices of people, corruption and malice just because we are the countries darker citizens, and our lives don’t matter to some. I know the smell of flowing tears as parents and grandparents suffered injustices at the hands of others, for just wanting to do better. And I have even experienced the smell of death as a child because the neighbors didn’t like the brown people moved in next door and killed our pet. I am afraid that recent events and especially this election may have set the U.S. back to such a time. A time when hurt anger and fear were always right at the surface – back over 50 years. We are to be kind to one another, to forgive, to be like God, to walk in love. Because perfect love casts out fear . . . I know the writer of Ephesians isn’t necessarily talking about the preaching task; he is talking about the new life that we live in Christ; he is taking about words that come from our months; he is talking about our better nature made possible through Jesus the Christ. With the recent events in my country I don’t want to preach, what wants to come from my mouth is a loud scream. But I am not my grandfather and it’s hard right now. So, I am looking for a word… a word that isn’t dependent on my actions, a word that doesn’t expect me to get it right when I can’t – a word that isn’t dependent on how I feel – good or bad. I know, as a preacher, I preach and my task is to set what is wrong with the world in-light-of the faith that we have in Jesus the Christ. That anything I say may give grace to those who hear. Yet I don’t know if I can. I suppose this may have been the way you felt in the middle of the Ebola crisis, afraid, cautious, angry at the injustice of it all. I can imagine that your pain was ten thousand times worse than how I feel right now. I can imagine you wondering when it would be over and what would happen afterwards . . . And yet Sunday after Sunday you were called to stand and preach, a word – a word of grace, a word of hope, a word of love. I can only imagine what strength, what dedication, what love that took. And yet you did! And preachers, the only way I know how to do that is through the word. Not through what I think, but through the word made flesh, through the words that point to hope and love, through the words of scripture. And reading to the end of the lectionary text for today I found that word. The word that is beginning to lift me from the depths of my despair at what has happened in my country-a word that calms my doubts and soothes my fears. I found that word that encourages me and keeps me going. Preachers I found that word that helps me remember that God can make a way out of no way; I found that word bishop that gives me joy deep down in my soul; I found that word that has the power to pick me up turn me around and place my fight on solid ground. Did you hear that Jesus is described as a fragrant offering? Jesus is a fragrance that floats in the air as love! Yes, people of God, I am hurt, angry and disappointed because of all that I have heard in the news about the elections in my country this last week, I don’t know what is going to happen! Yet, I am a preacher, and as I preach my task is to set what is wrong with the world in-light- of the faith that we have in Jesus the Christ.“That it may give grace to those who hear.” And I need God to help me! So, whenever I stand to preach, whenever you stand and preach whether the situation is pleasant or brings out feelings of anger, hurt or despair, take a deep breath and pray that you may draw in a whiff of that sweet, sweet fragrance – Jesus the Christ and give them grace! This week, I was able to step out of my normally scheduled program to be the chaplain for the ELCA/Global Mission Annual Musician Training. This is a once a year event where musician educators come together, to share, to learn and to be feed. It is one of the most diverse and ecumenical spaces that I have had the privilege to occupy. The gathering includes musicians that represent in their ethnicity most of the world: African, Asian, European, Indian, and Latin American. It also includes people from denominations and faith traditions other than Lutheran. For me this is a group that represents what the kingdom of God looks like. It was an amazing five days. The keynote speaker for the event was Daniel Onyango, a community activist from Kenya. He works and lives in one of the major slums in Nairobi Kenya. He brought with him his love for his people, his passion for justice and his skills as a musician. The gathering was blessed beyond words by his presence. Some of the people in the room were not church musicians; they were people who hold justice and love in their hearts and were there to sing, listen, pray and join in the spirit filled way that this event comes together. They were there to take back what they saw and heard so that they might be able to live out and be about the love of God that was evidenced in that place. All of this is possible because of the love and commitment of Rev. Sunitha Mortha who works in Global Mission as an educator for mission. She heads the Mission Formation team and is tasked with teaching the principle of accompaniment during events of the ELCA and spaces she is invited into. This group of glocal musician educators assist her in this task. This beautiful woman is all about mutuality, inclusivity, vulnerability, empowerment and sustainability. She walks it, talks it and lives it. This space is a space of accompaniment, justice and love. I was also privileged to preach at the pre-event with a group of musicians called “the core.” These are the musicians who lead and teach the rest of the participants. Below is the sermon I preached. I will not forget what I have seen and heard and how I have been strengthened in my work and witness by these amazing people and this event.